Kitty-Cat was our first stray cat visitor to our home here in Montana. 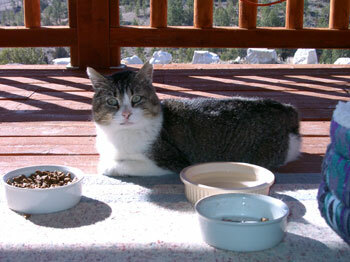 He showed up in the late spring of 2002 and would come on our deck and look in the door. When I saw him I decided to put out a dish of food in hopes to get him to return. He did not let me too close, but he stayed on the deck and once the food was down and I returned to the house and closed the door he came up to the food and ate. And thus began my short relationship with Kitty-Cat. 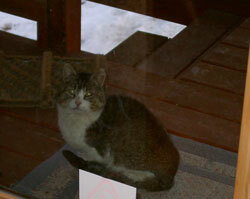 I began to put food and water out daily and he would come in the afternoon and evenings. He began to lay on the welcome mat, so I decided to put a cat cup/bed out for him. He took right to the cup like a fish to water. Actually the cup had another users, our neighbor had a sweet medium sized dog named Jake and he would come to our house daily. We would receive daily visits from Jake and when Donna and I went for a walk Jake would come with us. We seemed to be his home away from home and personal friends. But our adventures with Jake are the subject of a different biography, not Kitty-Cat's. As the waxing warmth of summer was building, another cat began to visit and often fight with Kitty-Cat. Bob was to be his name. But Kitty-Cat was undaunted and would return daily. By July he allowed me to sit with the door open (screen closed) and he would eat next to the screen as I spoke to him. He would often interrupt my one sided conversation with a few comments of his own, though never a hiss. Then one Saturday he allowed me to reach my hand out of the door and touch his nose. He rubbed his head against my hand and I knew I had made a new friend. 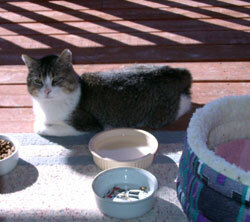 I came out of the house and sat on the deck with him that afternoon and he slept next to me, purring away. Most of the pictures I took of him were from that Saturday. He was sleeping in the cup as usual in the evening, then on Sunday he was gone, never to return again. I would go on the deck and call his name daily for a couple of weeks, but I never heard him call back. On the way home from work in late July I noticed a cat on the shoulder about 5 miles from home. The colors looked like Kitty-Cat's but I could not be sure. Eventually I pulled over and took a closer look. I was 90% sure it was Kitty-Cat. The colors, shape, size all told me so. I considered coming back with a shovel and burying Kitty-Cat, but the body was pretty far along in returning to the ground and was badly infested with insects and such. I decided to would be best to allow the proper return to the Earth at that point since Kitty-Cat was supplying nutrients to plants, insects and other animals. I told Kitty-Cat how much I will miss his company and that I promise to see him again one day if he waits for me. I like to think Kitty-Cat, Itchy, Electra, Hamlet, Calliope, Leo and Copycat are all playing in the heavens right now, waiting for the day we all can be together again. In loving memory of Kitty-Cat.